Allen, a UAB graduate and a clinical trials administrator at the Comprehensive Cancer Center, has authored numerous articles for medical journals on the disease. 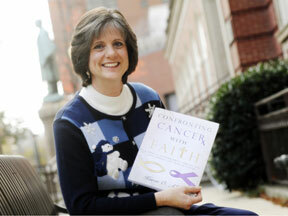 But it was her own walk with cancer that inspired her to write the book Confronting Cancer with Faith. It was the first and is the only book Allen has written. She says she wrote it to give encouragement, comfort and hope to cancer patients and their loved ones. Eight years after her initial diagnosis, Allen is encouraging men and women battling the disease to incorporate their cancer experience into an unforgettable time of spiritual renewal. “We can’t always choose what happens to us, but we can choose how we will respond,” Allen says. Allen recently spoke to UAB Reporter about her trials, her inspiration and the obstacles she had to overcome in writing her first book. Q. How would you describe your own battle with cancer from the perspective of someone who is involved in researching the disease every day? A. It was tough transitioning from being an employee in the Cancer Center to being a patient, but it enabled me to develop a deeper understanding from both ends of the spectrum. The research always has been significant but it became personal with a sense of urgency. Visualizing my name as a clinical trial participant reminds me of how my job impacts lives. Q. What were your first thoughts after your diagnosis? A. My first thought was, ‘Is this for real? I’m too healthy!’ Even though it was shocking, I felt in some ways I had been prepared for the diagnosis. My thoughts turned more to my loved ones rather than to myself in hopes they could accept all aspects of the journey, whatever the outcome. Q. Was it difficult for you initially to face cancer with faith? A. Not at all since I knew that was where my strength would be found. Of course there was some amount of fear, but I chose to turn the experience into something advantageous resulting in an incredible journey of faith. My book describes how others can do the same. Q. Is your book only for those with breast cancer? A. Absolutely not. My book is relevant to all types of cancer for both genders; that’s why the front cover has a lavender ribbon and not a pink ribbon. Q. How has your cancer experience changed you? A. I live each day with a more eternal perspective. A new purpose has been unveiled to me to bring comfort and reassurance to those in crisis, especially cancer. I’ve learned there can be spiritual benefits through suffering. And like most survivors, I am more aware of each moment of life, not taking things for granted — like eyelashes and hair. Q. How did you approach writing a book? A. With ignorance and trepidation showered with a massive dose of determination. Most people start small and advance to larger projects, but I didn’t follow that unspoken rule. I plunged in headfirst and swam the backstroke. I have since written several non-medical articles published in magazines and newspapers. Q. What tips would you give someone who wants to write a book, but feels intimidated? A. I laugh when people ask me about publishing a book, saying that if I knew then what I know now, I might not have pursued it. Evaluate your purpose and level of commitment. Don’t fool yourself into thinking that writing the book is the hardest part. Attend a writer’s conference and/or writing class for insight and connections, find a mentor and execute all endeavors with professionalism. Q. Where is Confronting Cancer with Faith available for purchase? A. Barnes & Noble at The Summit, Little Professor in Homewood, Cokesbury and The Carpenter’s Shop in Vestavia, Inverness Family Christian Store, SpiritFilled Christian Bookstore downtown, Amen Corner in Pelham and online through my website at www.confrontingcancerwithfaith.com. You also may call 1-877-421-7323.